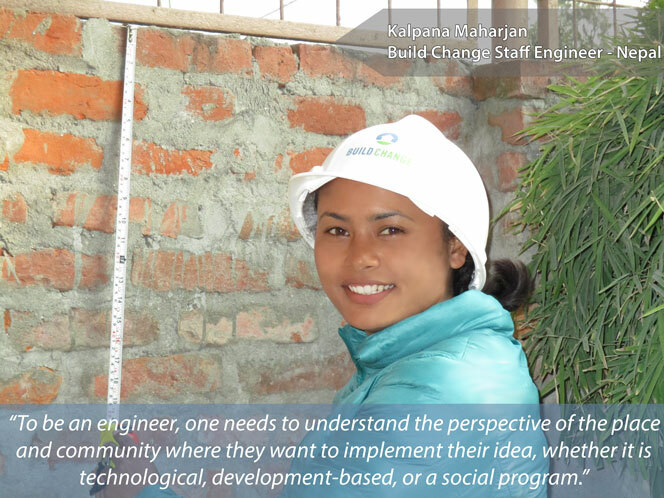 My name is Kalpana, and I am a Staff Engineer with Build Change in Nepal. I am a civic engineer, and alongside working with Build Change I am also earning my Masters in Earthquake Engineering. I have been working in the fields of infrastructure development and livelihood improvement for three years, and strongly believe there is a need for the continued improvement in these fields for the well-being of Nepal. Since I was a child, I knew I wanted to be an engineer. Everywhere I looked, I saw that Nepal had a lot of work to be done. When I had to choose a career path after high school, it was an obvious choice: I would be an engineer. I love that being a civil engineer entails not only excelling in technological and scientific disciplines, but understanding the people, places, and the cultural needs of a community. I love working with new ideas, designs, and technologies to meet the needs of various people and communities. I believe that to be an engineer, one must first be responsible for all they do. They need to understand the perspective of the place and community where they want to implement their idea, whether it is technological, development-based, or a social program.